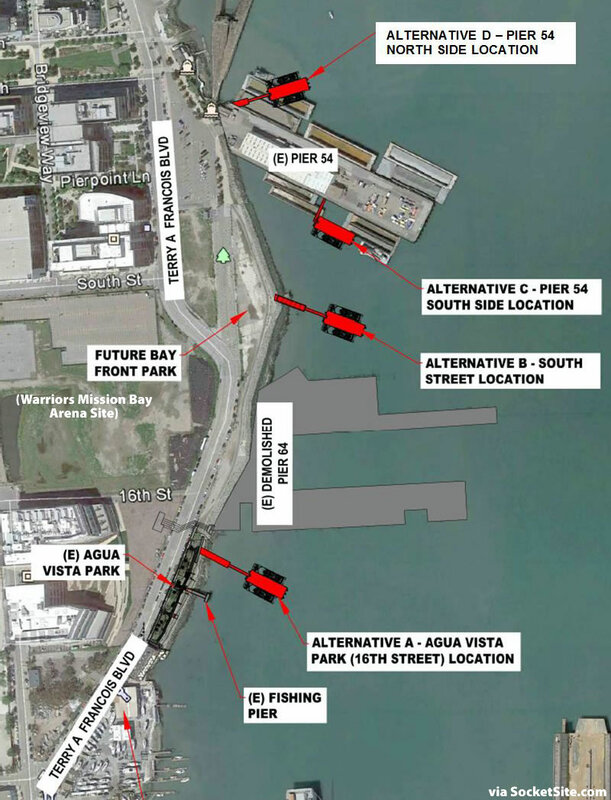 The Port of San Francisco is preparing to issue a Request for Proposals (RFP) for the design of a ferry landing in Mission Bay. And based on the Port’s internal timeline, construction of the Mission Bay Ferry Landing, which has yet to be funded, is anticipated to commence in 2020 and be completed in 2022. Alternative A – Agua Vista Park (“16th Street”) site has the best wave climate of the various alternatives because BAE drydock shelters it from wind induced waves, eliminating the need for a breakwater system. Alternative A is within a block of the planned Golden State Warriors Arena, the 46-acre, 550-bed UCSF Mission Bay campus, the T-Third and future Central Subway light rail line and the planned transit priority line on 16th Street. One disadvantage for the Alternative A is its close proximity to the BAE San Francisco Ship Repair facility. BAE will need to maneuver vessels in or out of their facility, 5 to 10 times a month, and one of these vessels may delay ferry service. 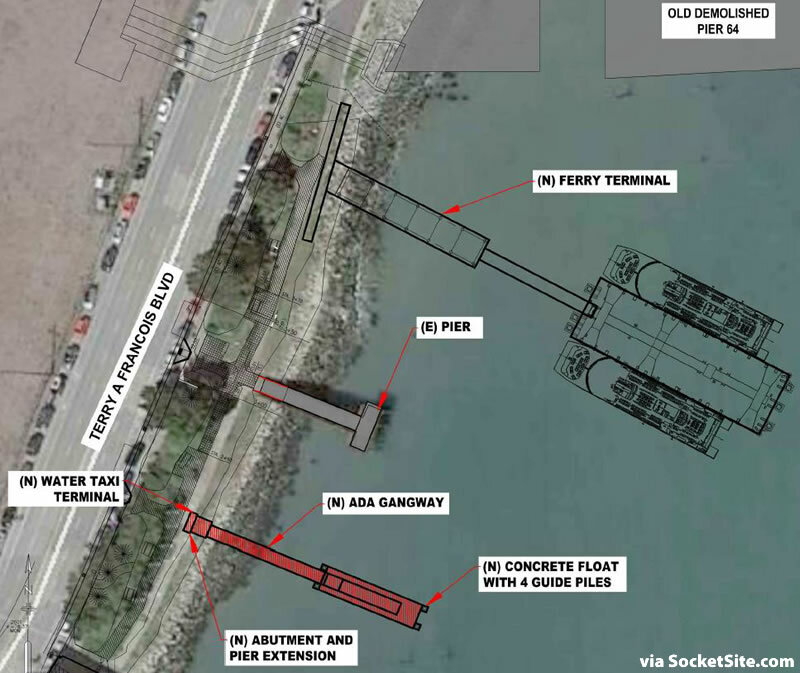 Additional dredging of Pier 64 is likely needed to provide ferry access from the north/northwest and to alleviate any navigational conflict with BAE. Staff recommends Alternative A as the preferred landing site. Alternative B – South Street site is a viable location for the ferry landing provided a 350-foot fixed breakwater system east of the landing is constructed. Without the breakwater the wave conditions at the site, especially in the winter months, could frequently exceed operational limits for ferry service, resulting in increased downtime when compared to Alternative A. Alternative C – Pier 54 South Side site is not a viable location for the ferry landing. The major disadvantage for the Alternative C location is that it requires a significant investment to seismically upgrade the entirety of Pier 54 to allow for construction of a new ferry landing. This location is also subjected to strong wave conditions resulting in potentially significant operational downtime. This option was removed from consideration early in the study. Alternative D – The Pier 54 North Side site is a viable location for the ferry landing. The landing would be located at the northwest corner of Pier 54 requiring only a small portion of Pier 54 to be seismically isolated and upgraded. The interface between pedestrians accessing the ferry landing and vehicles accessing Pier 54 may be a disadvantage. Also the site is farther from the ‘epicenter’ of the Mission Bay Development, namely, 16th Street. The primary reason for Alternative D being the least expensive site is that it requires less dredging than Alternatives A and B. In addition, the development of an independent water taxi landing, a little to the south of the Alternative A site for the ferry landing, has been recommended as well, with an estimated total project cost, for both the ferry and water taxi landings, ranging from $32.5 to $42.7 million depending on the location selected. The Port is preparing to announce the existence of RFP for the Bay Ferry Landing project next month, issue it in July, and currently expects to commence the project design in December. I look forward to an over-designed proposal that costs too much, gets most of its scope eliminated prior to breaking ground, and still somehow ends up costing significantly more than originally budgeted. …and taking significantly longer than originally projected. Breaking ground in 2030, and only a $1 billion more than promised! If these three comments weren’t so funny…and so true! The scope should include stops down and around the D10 area such as Pier 70, and over near India Basin and the Cargo Way area (possibly near the Bay/Natives/Oracle docks and drawbridge, or all the way out and around the Candlestick Point and Lennar’s BVHP project, inclusive of where the Geneva Harney route and Candlestick point area is being developed. It’s a tough sell though for anyone who does not need to cross a bridge or living within walking distance of a terminal. Kind of slow and expensive. True. You first have to find a way to get to the terminal if you’re not within walking distance. How does Seattle compare in terms of ridership, access and cost? Why separate docks for the ferry and water taxis? In addition to increasing capacity at peak times, the water taxi landing at the recommended site would provide the Ferry Landing with shelter from wind induced waves. I think you’re confusing the protection provided by the BAE drydock with the water taxi dock. The latter is so short, it’s hard to imagine it does much to reduce waves. According to an initial study, the water taxi landing would help shield the ferry landing, eliminate competition between the taxis and ferries for landing space, and reduce potential delays. According to Wikipedia, the South SF ferry’s MONTHLY ridership is at meager 9652. Muni line 22 do more than twice of that in a day than the ferry do in a month. In reality, these boats are only expensive fancy toys. If you run a bus between the piers, it is 21 minutes without traffic and 30 minute with traffic, according to Google map. Ferry between Oakland and Ferry building takes about the same time. But you can run the bus much more frequently. And you can stop at several points rather than just the single point at the pier. On the other hand from the pier you might need additional shuttle service. Ferry might look fun. But it does not necessary serve the passengers well. Between 16th St and Oakland. On GoogleMaps, it shows the trip as over 50 minutes. Checked again at 10:50am. East bound in the morning is 22 minute. West bound is much worst. 41 minute for solo driving I believe. A combination of bus 72M, BART and K/T is 49 minutes. I have reason to believe a direct connection between the two pier can be much quicker. Your assumption is that this is about commute times, ignoring replacement value. If the goal is to get people out of their cars and off the roads buses are a horrible alternative to cars.. or BART… or trains… or ferries. “That was an enjoyable MUNI ride, I wish it hadn’t ended” —said no one ever. I once caught a 22 that was on its last run, heading to the end of the line, then barn, and home for the driver. It was a joy to be going that fast on a bus in SF. Mind you, it was a bit terrifying, as well. Mostly agree although that SSF ferry lands in a rather remote location. Most of the riders work at Genentech and need a last mile shuttle. Ferris are already a tough sell. At least this one will go to a location with a lot of activity near by. I believe the ferries actually have a pretty good record of farebox recovery, ie the fraction of their costs that come from fares paid. Muni is pretty bad at 22% (similar to most bus services). GGT ferries have a pretty decent 47%. A big part of that, I assume, is that one of the biggest costs is employees, and you can get a lot more passengers per employee on a ferry than you can on a bus. Bart is the best in the Bay Area, I think, with 75%. This ferry is likely the second best terminal location in the Bay Area and will be used. Ferries also provide redundancy in the event of issues with BART and bridges. Ferry ridership should certainly be encouraged IMO. When it comes to policy matters, disincentives to driving solo have to be considered. Whatever happens I hope that these new ferry landings are designed to seismic standards that far exceed requirements. In other words they should not only be safe for evacuation immediately after the Big One, they should also be able to support continued ferry operations in the weeks after. A big quake will knock out every road and rail link to the city and an operational ferry service will reduce the isolation of San Francisco Island.